The Iraqi military's offensive in Basra was supposed to demonstrate the power of the central government in Baghdad. Instead it has proven the continuing relevance of anti-American cleric Moqtada al-Sadr. Sadr's militia, the Mahdi Army, stood its ground in several days of heavy fighting with Iraqi soldiers backed up by American and British air power. But perhaps more important than the manner in which the militia fought is the manner in which it stopped fighting. On Sunday Sadr issued a call for members of the Mahdi Army to stop appearing in the streets with their weapons and to cease attacks on government installations. Within a day, the fighting had mostly ceased. It was an ominous answer to a question posed for months by U.S. military observes: Is Sadr still the leader of a unified movement and military force? The answer appears to be yes. That apparent authority is in marked contrast to the weakness of Iraq's Prime Minister, Nouri al-Maliki. He traveled south to Basra with his security ministers to supervise the operation personally. After a few days of intense fighting he extended his previously announced deadline for surrender and offered militants cash in exchange for their weapons. Yet in the cease-fire announcement the militia explicitly reserved the right to hold onto its weapons. And the very fact of the cease-fire flies in the face of Maliki's proclamation that there would be no negotiations. It is Maliki, and not Sadr, who now appears militarily weak and unable to control elements of his own political coalition. Sadr, in fact, finds himself in a perfect position: both in politics and out of it, part of the establishment and yet anti-establishment. Despite the fighting, he never pulled his allies out of the government or withdrew his support from Maliki in Parliament, which he could have done. Nor did he demand that all his followers leave Parliament and work outside the current political system. He has kept his hand in as a hedge. Sadr has proven increasingly adept at politics. Last summer, he ordered his hand-picked ministers out of Maliki's cabinet after the Prime Minister refused to demand a timetable for withdrawal of U.S. troops. To the public, it looked like he was taking a principled stand against the occupation. But the boycott did nothing to dilute his influence in the government. All the ministries his party once headed are still staffed to the gills with his followers, who continue to create jobs for other loyalists and operate Sadr's growing political machine. Sadr is, in addition to being a military force, a source of political patronage. He can now play the victim card, arguing that Maliki and the Americans had attacked him and his loyalists, even while allowing the militias of his Shi'ite rivals to prosper  as well as the U.S.-paid Sunni militias that are now being integrated into the Iraqi police and army. He can reasonably argue that he is the one true Iraqi patriot, the Iraqi leader the Americans fear most. How else to explain the attack on his Mahdi Army while he was observing a unilateral cease-fire? Furthermore, like Hizballah in Lebanon after the Israeli invasion in 2006, the Mahdi Army can claim a victory by simply surviving an assault by an Iraqi government backed by the Americans. That is significant street cred. Strategically, Sadr called a cease-fire at the right time: practically synchronized to get the maximum political benefit while preserving his military capabilities. Again, it is a lesson he learned from recent experience. 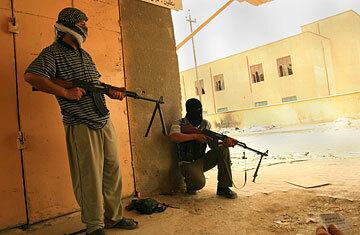 In 2004 Sadr's militia was severely damaged in fighting with American soldiers and Marines. In the process, however, Sadr became a symbol of Shi'ite resistance to the U.S. military occupation and parlayed that reputation into a seat at the political table. And so now, just when it appeared that he might be marginalized again, the Iraqi government has burnished Sadr's image as a leader who defies the United States and an Iraqi government that refuses to eject U.S. troops.